The devotion to Our Lady of America has its source in a personal diary by Sister Mary Ephrem in which she describes apparitions of the Blessed Virgin Mary she claims to have experienced some time prior to 1956. Sister Mary Ephrem (baptized Mildred Neuzil), was born in Brooklyn, New York in 1916 and in 1933 was professed in the Congregation of the Sisters of the Most Precious Blood of Jesus of Dayton, Ohio. The ministry of the Sisters of the Most Precious Blood includes prayer, education, art, music, care of the elderly, social services, healthcare, parish and pastoral ministry. Around 1957 Sister Ephrem became part of a cloistered contemplative branch of the same congregation established in New Riegel, Ohio. The New Riegel cloister received papal approval in 1965. In 1977 the three surviving members, including Sister Mary Ephrem, separated from the Sisters of the Precious Blood and formed an autonomous congregation, the Contemplative Sisters of the Indwelling Trinity in Fostoria, Ohio, directed by Sister Mary Ephrem. She also established an organization called, "The Our Lady of America Center." The Holy See rejected their petition for separation the following year on the grounds that three was "too small a number for a well-formed community." The Sisters of the Indwelling Trinity survive to the present day even though they never received approval or have been recognized by the local ordinary of Toledo, Ohio. Sister Mary Ephrem died in 2000. Sister Mary Ephrem allegedly experience seemingly mystical spiritual experiences of Our Lady of America between September 25, 1956 and November 15, 1956 in the Our Lady Mother of Mercy Chapel in Rome City, Indiana. According to Sister Ephrem's personal diary, upon which accounts of the alleged apparitions are based, these visits requested devotion to the Blessed Virgin Mary and asked Sister Ephrem to propagate them. She then turned to Monsignor Paul Francis Leibold, her spiritual director until 1972. It is said that Sister Ephrem was asked to have a medal struck that would bear the image of Our Lady of America on the front and the symbol of the Christian Family and the Blessed Trinity on the back. The Sisters of the Precious Blood later sold the Rome City property to The Way International, a biblical research, teaching and fellowship ministry. A booklet containing the contents of the revelation, and bearing the Imprimatur of Archbishop Leibold, Sister Mary Ephrem's spiritual director, was published in 1960 and again in 1971. A distinction must be made between the devotion to Our Lady of America itself and the claimed apparitions said to have initiated it. In 1963, Leibold, then an auxiliary bishop of Cincinnati (later Archbishop of Cincinnati 1969-1972), granted his Imprimatur to the test of a prayer Sister Mary Eprhem had written in honor of Our Lady of America, and to the design of a medal. While a number of church officials have indicated support for the devotion, finding nothing against church teaching, no decision has been rendered as yet with regard to the supernatural origin of the reported apparitions of Our Lady to Sister Mildred Neuzil. Reports and claims of healings upon the grounds at Rome City, Indiana have not been verified and approved by the Catholic Church. 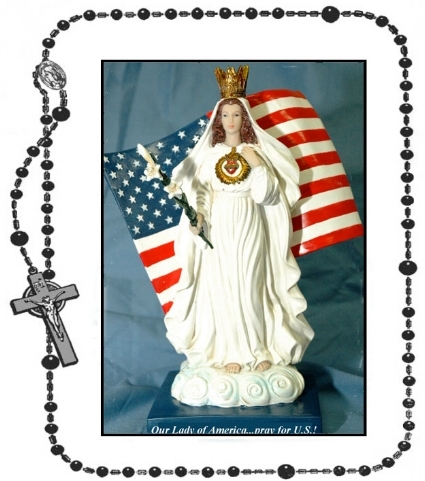 The Roman Catholic Archdiocese of Cincinnati has stated that the Devotion to Our Lady of America, as a matter of private revelation, has not been canonically approved despite the claims of some individuals.